Isn’t there a 4000-year rule? Don’t the Greeks do it differently? When did country X change from the Julian to the Gregorian calendar? The Gregorian calendar is the one commonly used today. 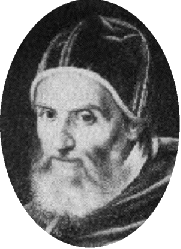 It was proposed by Aloysius Lilius (a Calabrian who had studied medicine and astronomy in Naples) and adopted by Pope Gregory XIII (pictured above) in accordance with instructions from the Council of Trent (1545-1563) to correct for errors in the older Julian Calendar. It was decreed by Pope Gregory XIII in a papal bull on 24 February 1582. This bull is named “Inter Gravissimas” after its first two words. In the Gregorian calendar, the tropical year is approximated as 36597/400 days = 365.2425 days. Thus it takes approximately 3300 years for the tropical year to shift one day with respect to the Gregorian calendar. The approximation 36597/400 is achieved by having 97 leap years every 400 years. So, 1700, 1800, 1900, 2100, and 2200 are not leap years. But 1600, 2000, and 2400 are leap years. It has been suggested (by the astronomer John Herschel (1792-1871) among others) that a better approximation to the length of the tropical year would be 365969/4000 days = 365.24225 days. This would dictate 969 leap years every 4000 years, rather than the 970 leap years mandated by the Gregorian calendar. This could be achieved by dropping one leap year from the Gregorian calendar every 4000 years, which would make years divisible by 4000 non-leap years. This rule has, however, not been officially adopted. Every year which when divided by 900 leaves a remainder of 200 or 600 is a leap year. This makes 1900, 2100, 2200, 2300, 2500, 2600, 2700, 2800 non-leap years, whereas 2000, 2400, and 2900 are leap years. This will not create a conflict with the rest of the world until the year 2800. This rule gives 218 leap years every 900 years, which gives us an average year of 365218/900 days = 365.24222 days, which is certainly more accurate than the official Gregorian number of 365.2425 days. However, this rule is not official in Greece. The papal bull of February 1582 decreed that 10 days should be dropped from October 1582 so that 15 October should follow immediately after 4 October, and from then on the reformed calendar should be used. This was observed in Italy, Poland, and Spain/Portugal. Other Catholic countries followed shortly after, but Protestant countries were reluctant to change, and the Greek orthodox countries didn’t change until the start of the 1900s. The following list contains the dates for changes in a number of countries. It is very strange that in many cases there seems to be some doubt among authorities about what the correct days are. Different sources give very different dates in some cases. The list below does not include all the different opinions about when the change took place. Different areas changed at different times. The Gregorian calendar replaced the Chinese calendar in 1912, but the Gregorian calendar was not used throughout the country until the communist revolution of 1949. The Gregorian calendar was introduced to supplement the traditional Japanese calendar on 1 Jan 1873. Along the Eastern seaboard: With Great Britain in 1752. Mississippi valley: With France in 1582. Washington, Oregon: With Britain in 1752. Alaska: October 1867 when Alaska became part of the USA. 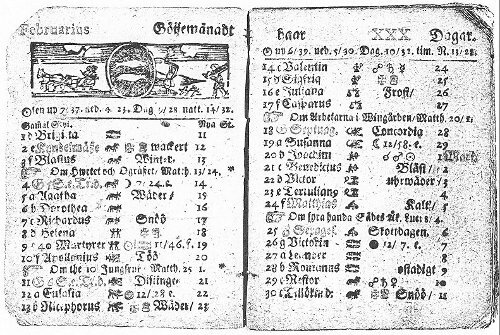 A Swedish almanac from February 1712. So 1700 (which should have been a leap year in the Julian calendar) was not a leap year in Sweden. However, by mistake 1704 and 1708 became leap years. This left Sweden out of synchronisation with both the Julian and the Gregorian world, so they decided to go back to the Julian calendar. In order to do this, they inserted an extra day in 1712, making that year a double leap year! 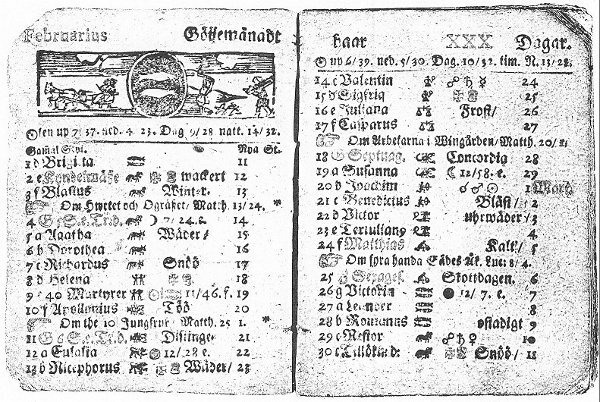 So in 1712, February had 30 days in Sweden. The image to the right shows a Swedish almanac from 1712. In the top left corner you see the word “Februarius”, and at the bottom of the right page, the 30th day of that month is mentioned. The image below is a copy from the church registry in St. Petri Parish in the Swedish town of Ystad. ^  http://www.ddss.nu/swedish/curiosities.htm, retrieved 28 August 2011. No longer available..